RPG-a-Day 2018 – Week Four: WHICH… non-dice system appeals to you? This is a tough one for me. When I think of non-dice systems, the only one I can think of is Amber Diceless and I have never played it, so I don’t know if I like it or not. I like plenty of games that don’t use dice, but none of them are role-playing games. It gets trickier if the question isn’t using “system” in the sense of “rules system” but rather in the sense of a mechanic (though since yesterday’s question was about dice mechanics, maybe it’s not… who knows? Crunchy stuff like systems and mechanics are things I dig deeply into; I’m more of a fluff guy). I like Hero Point systems (whether they’re called Bennies, Hero Points, Inspiration, etc.) because I enjoy mechanics that let players do cool things that may not otherwise be allowed by the rules. Anything that allows the players to think “Wow, that was awesome!” is something that helps make the game session better for everyone. RPG-a-Day 2018 – Week Four: WHICH… dice mechanic appeals to you? I like Dice Pools. I like throwing more and more dice the more proficient my character gets. I also like the idea of adding opposed dice based on difficulty. Fantasy Flight Game’s narrative dice system, such as they use in their Star Wars RPGs and in Genesys clicked with me pretty quickly. I like how you can fail but still gain an advantage, or you can succeed but still create complications, or how you can succeed overwhelmingly or fail utterly. I like how you not only can use more dice as you become more skilled, but you can also improve the die type (thus giving you better chance to receive ideal results). RPG-a-Day 2018 – Week Four: WHICH… game mechanic inspires your play the most? Long answer: I don’t analyze or develop game mechanics enough to feel inspired by them. I prefer when game mechanics get out of the way and facilitate fun play. If I have to spend half of my play/prep time thinking about mechanics (ESPECIALLY during character creation), then that is not the game for me. As I’ve gotten older, I’ve come to prefer games with fewer, less specific mechanics. RPG-a-Day 2018 – Week Three: What music enhances your game? Obviously, it depends on the kind of game. If I was running an espionage game, I would use Jazzy, James Bond-style music. When I run Star Wars, I pull the music from the film soundtracks. I would likewise go to the source for a Star Trek game. When I run a fantasy game, like D&D, however, I have multiple resources. I’m a big fan of Tabletop Audio. I can queue up several appropriate ambient tracks and have them repeat in the background. When a fight occurs, I have a custom playlist in iTunes with battle music from The Witcher 3 and Elder Scrolls Online. I have another custom playlist with music appropriate for taverns. Rarely do I play it loud enough to drown out talking; it’s there for background ambience and should never take center stage over the players unless music is the point of the scene. RPG-a-Day 2018 – Week Three: What art inspires your game? 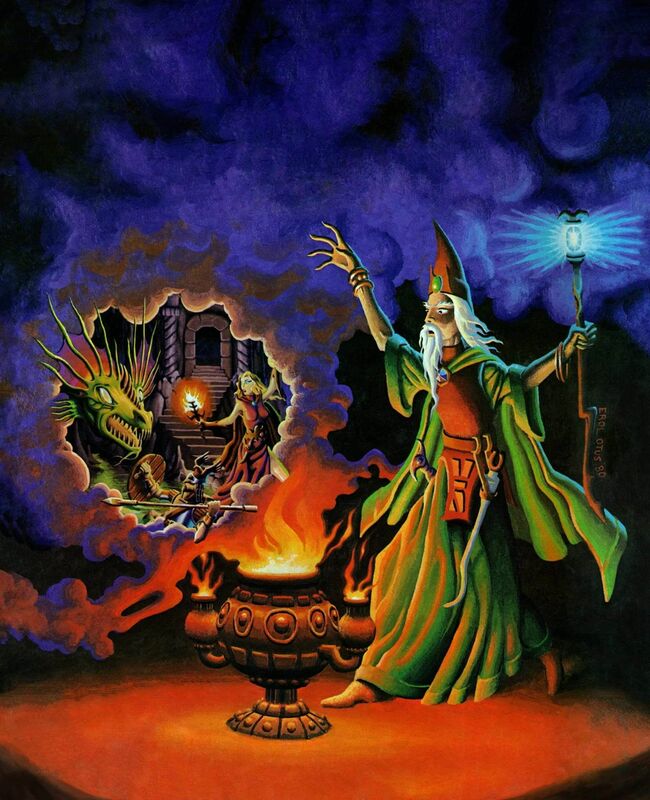 What I liked about this piece in particular is that the wizard is scrying on the scene depicted in the Basic Set. It was a really cool way of tying the two products together. RPG-a-Day 2018 – Week Three: DESCRIBE… the best compliment you’ve had while gaming. My games tend to not be particularly theatrical, so the compliments I get are probably a little more low-key than you get watching some of the more popular live-play videos. Plus, as long as everyone is laughing and engaged, I don’t need specific compliments to know I’m doing well, so just a “good game” or a fist bump after a particularly cool encounter is enough for me. RPG-a-Day 2018 – Week Three: DESCRIBE… your plans for your next game. You want me to give everything away? Some of my players read these blogs! There’s two ways to answer this: my “next game” being the next time we get together to play and the “next game” being the next adventure campaign I’m going to run. The next time we get together to play, the plan was to continue our Tomb of Annihilation campaign. We’re only about eight sessions in, so there’s still a lot to discover and no one has died yet, despite it’s meat-grindery reputation (some of which could be attributed to differences in play style; I don’t particularly enjoy adversarial games). However, due to a player absence, the plan has changed, and we’ll once again play the Barbican Bastards in our Blades in the Dark game. If you want to know about the next campaign I’m going to run, well, that’s too far off for me to have anything set in stone. I’ll probably take a break after Tomb of Annihilation so we can all play some Blades in the Dark (so I can actually play instead of GM). I might be in the mood to run sci-fi after that (maybe Star Wars D6) or a series of short, one – two session games using some of the new RPGs I’ve acquired. Heck, maybe by then Western RPG will be out and we’ll get some cattle rustling action going. Maybe Pulp Cthuhlu or Masks of Nyarlathotep (unlikely since most of my group is not enthused about Call of Cthulhu). RPG-a-Day 2018 – Week Three: DESCRIBE… a tricky RPG experience that you enjoyed. I’m not sure what’s meant by “a tricky RPG experience.” Is it one where the scenario was loaded with puzzles and “gotchas!” that require more player skill than character abilities? It is one where you later found out the GM was a horrible person, but you enjoyed the game at the time? Is it one where you generally expect the game itself to be a total train wreck and you hate the system, but the GM manages to pull off an amazing game regardless? … I just don’t know. RPG-a-Day 2018 – Week Three: DESCRIBE… a failure that became amazing. RPG-a-Day 2018 – Week Three: DESCRIBE… how your play has evolved. Back when I started, playing D&D meant little more than going through dungeons, killing monsters and taking their stuff. Sure, we played all the standard modules over time, but still, they were little more than choose-your-own killing order. Eventually, we started paying attention to the story and actually interacting with NPCs as more than just vending machines for selling our loot. These days, when I write adventures for my group, I try to make sure there’s at least as many social encounters and skill challenges (not to be confused with the skill challenge mechanic from D&D 4E) as there are combat encounters. I’m certainly more than willing to roll with the group when they decide to use clever tactics and their characters skills to avoid a combat (or spend time planning a way to totally obliterate the encounter at little risk to themselves).